Hoosic Valley PTO is selling the Capital Region SaveAround coupon books. 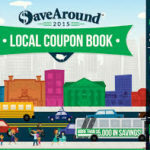 SaveAround is a coupon book that offers hundreds of buy-one-get-one-free discounts and other offers. You will find out that the book pays for itself after using it just 2 or 3 times! For every 5 books a student sells, he/she will get 1 book FREE! *Each child is being sent home with 1 preview book and order form. IMPORTANT: To keep this book, you will need to buy this book and/or if sell 5 books and you can keep the preview book, as this would be your FREE book. *Be sure to send in the money for all books sold. *If you didn’t sell a book, you must return your preview book or the school will be charged!! Seller Delivers – Enter the required information on the envelope to place an order. Direct Shipment– Enter the required information on the envelope and we’ll take it from there! Online Order– Give this URL http://www.supportourgroups.com/GN/25116 to your family and friends who live out of town so they can order online and support our fundraiser! Must have the students NAME, PHONE NUMBER, TEACHER NAME. Along with the Money for additional sales. *Remember, this is NOT meant as a door-to-door sale to strangers. The safety of your student is our first concern. Parents/Guardians, try to sell to relatives, neighbors and co-workers.